Doorbells are your home’s way of saying hello. So why settle for any ol’ ho-hum ding-dong when you could have one that shows off your sense of style, or sense of humor? If you’re looking to make a memorable first impression the instant people reach your front door, you’re in luck: Check out some of these anything-but-ordinary doorbells, which are sure to make your home stand out (hopefully in a good way, but hey, that all depends on your visitors). Keep your guests on their toes with this nuclear doorbell (Olives Tool, $119.48). Deafening sirens, flashing lights, and a loud voice issuing a warning to residents isn’t particularly welcoming, but it sure makes a statement! Granted, “This is not a drill!” could get old fast, but seeing your visitors’ surprised expressions probably makes it all worthwhile. This instrument is battery-operated, so no hard-wiring required. 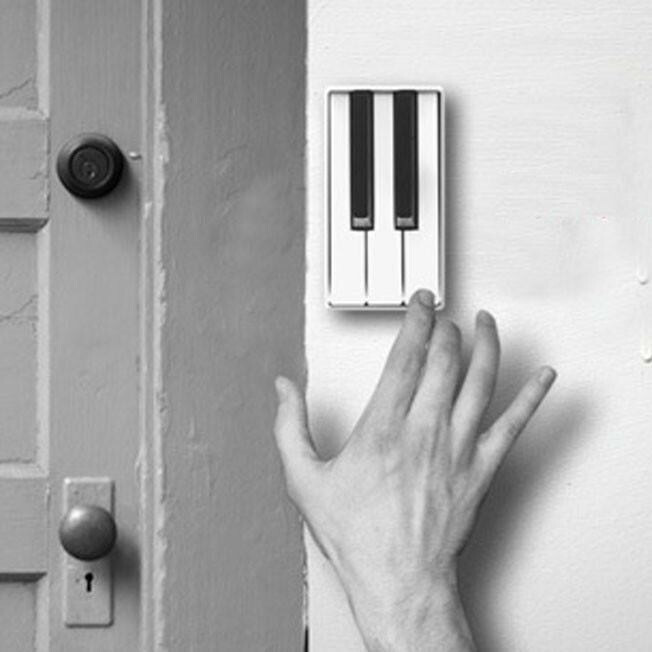 This piano chime (Odd Gifts, $27.45), created by designer Jianye Li, allows aspiring musicians to have a little fun while they wait for the host to open the door. You can’t actually compose a song on it, as it’s preprogrammed with more than a dozen pieces of music, but the innovative instrument is waterproof and battery-operated, meaning no hard-wiring is necessary. Sounds like a perfect gift for the pianist-homeowner in your life. This doorbell is a DJ’s dream come true, where visitors can scratch out their own tune thanks to the tiny turntable. Best of all, inhabitants in the home can each get their own separate button—and corresponding ditty—so you never need to get up to answer the door for anyone but your own guests. Unfortunately, this doorbell isn’t for sale yet, but its creator shares how he devised this musical masterpiece. So, if you’re feeling rhythmic and industrious, you can build your own. Pretty original! Though Kedslie isn’t selling his invention yet, he does explain how he designed this doorbell on his website. Just think how attractive it would be if this melodic panel could be embedded in your front door! You could retire your old-fashioned knocker and revel in a high-tech and seamless upgrade. Dubbed the “play anything doorbell,” this high-tech device (iChime, $129.95) comes with a built-in sound library that includes chimes (like what’s played at Westminster), holiday songs (“Deck the Halls”), Halloween themes (sinister laugh, Beethoven’s 5th), “fun sounds” (duck quack), and special occasions (“Happy Birthday,” “Auld Lang Syne”). As if that weren’t enough, you can also record your own greeting or connect it to an MP3 player to create the musical alert you’ve always wanted. Flo Rida‘s “My House,” anyone? This takes just minutes to install. If you’re tired of your pooch scratching at the door to regain entry, treat him to his own doggy doorbell (Chewy.com, $29). 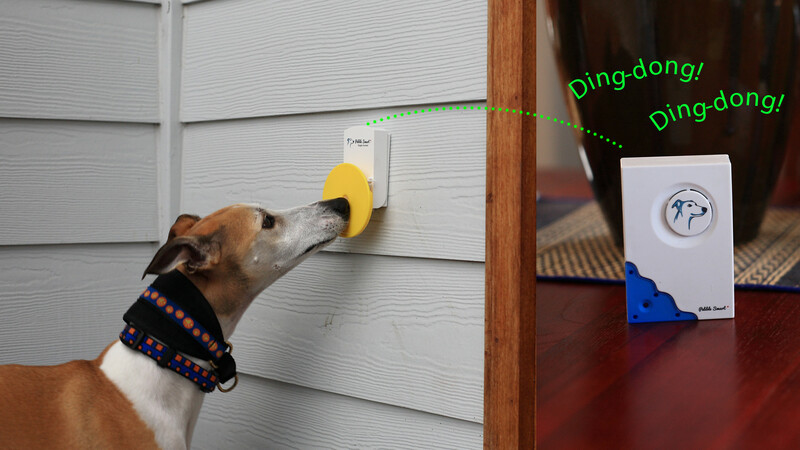 Rover will be sure to give his bark a break because this gadget has a built-in treat holder behind the yellow push plate. Interesting variation on Pavlov‘s bell, right? Rain- and snow-resistant, this doorbell lets owners choose from 36 tones and can also send a cellphone alert within a range of 250 feet.